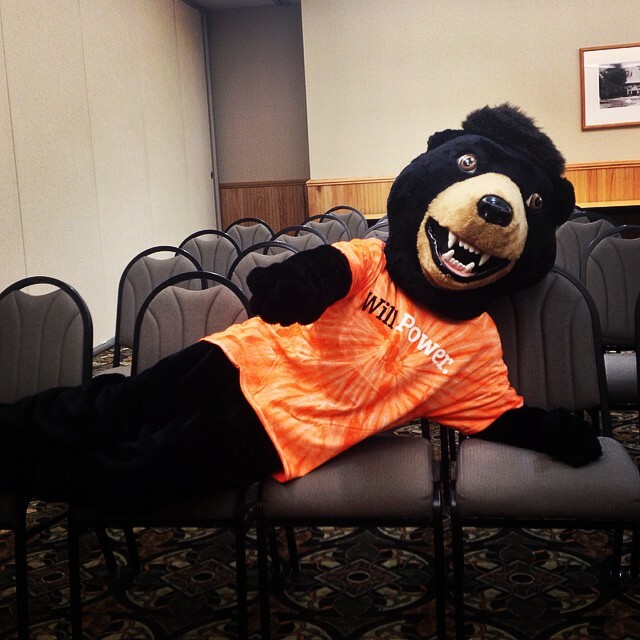 What Does Billy the Bear Do Over Winter Break? It’s five o’clock in the morning and I have an idea stuck in my head. The sun isn’t quite up yet, but I’m thinking about Billy the Bear. “Billy the Bear dancing around campus over winter break. Billy takes a quick breather during a long day of shooting. It was a sleepy, clumsy start to what would become one of my all-time favorite Twillyp videos. The concept: With students away on winter break, our lonely mascot wanders around campus. With the help of our awesome faculty support, we were able to schedule a time to rent out the Billy suit. We were ecstatic. We planned as much as we could, knowing that the campus would be full of opportunities and inspiration. And, as it turns out, two of my favorite scenes were on-the-spot improvisations. In one shot, Billy lifts weights with a student we found working out at the gym. In another, he replaces the sign on the women's bathroom with a piece of paper that reads, “Bears." This scene works because Shannon, in a head-to-toe bear suit, somehow expresses a coy bear giggle. Shannon, the only team member tall enough to fit in the suit, was de facto selected to star as Billy. What we did not realize, however, was that this was the role that Shannon was born play. She enthusiastically posed for selfies with passing students. She dropped it low in the student center. She conveyed an astounding range of bear emotions. Shannon became Billy. Shannon was the best Billy that any of us had ever seen. We vowed to thank her parents for sending her to sleepaway theater camp in seventh grade. Shannon breaking it down as Billy. Sorting through our hours and hours of footage, we encountered the best kind of problem; choosing which shots to cut was excruciatingly difficult. We loved everything we had. It remains one our most-watched videos, and stands out as one of my all-time favorite Twillyp projects.